Rosa Luxemburg was a Polish political philosopher, economist, marxist, and revolutionary who played a pivotal role during the First World War and the German Revolution. She founded, along with Karl Liebnecht, the anti-war Spartacus League in 1915, which later became the Communist Part of Germany. The Red Flag, the vital organ of the Spartacist movement, was also founded by her during the German Revolution. Until the Russian Revolution, Luxemburg believed that a revolution would certainly take place in Germany, but when Russia revolutionized, it became one of the most important experiences in Luxemburg’s life. She moved to Warsaw to participate, and was captured. She gained valuable ideas from this experience which she presented in her 1906 work The Mass Strike. According to Luxemburg, mass strikes are the best method the working class can use to gain victory. Mass strikes are likely to act as a fuel in any socialist revolution. Her point of view differed from Lenin’s as she did not believe in a tightly-structured political party. 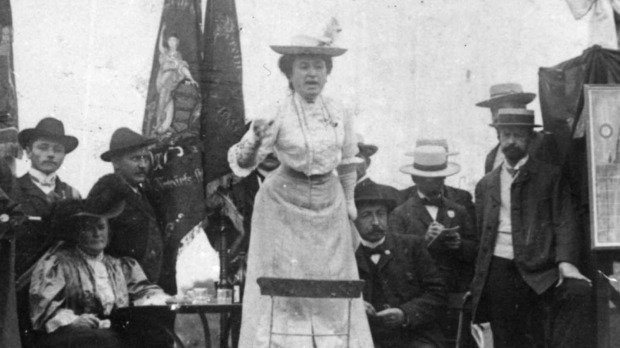 Through the Dialectic of Spontaneity and Organization, her significant political philosophy, Luxemburg put forward the idea that through spontaneity, organization and order can be achieved, when working for class-struggle through a political party. She held the view that class struggle reaches a higher level when it starts spontaneously from within the proletarians. In her 1913 work, The Accumulation of Capital, Luxemburg analyzed economics and politics and put forward the theory that the spread of capitalism in undeveloped areas of the world leads to the nuisance of imperialism. She also left the Social Democratic Party during this time as she struggled for the initiation of mass action. Along with Karl Liebknecht, she founded the Spartacus League, which was based on her 1916 pamphlet, The Crisis in the German Social Democracy, written in jail. Through the League, they intended to end the World War and establish the rule of the working class, but the actual impact of the League during the war did not prove to be as strong as it was intended. Written in 1922, The Russian Revolution criticized the Lenin’s party for their terror-inducing and tyrannical methodologies. Luxemburg championed democracy, unlike Lenin who supported democratic centralism. She also chastised the Bolsheviks’ opportunist and agrarian political policies during The Russian Revolution. Due to her strong opinions and ideas during the Spartacus Revolt, she was arrested in Berlin by conservative paramilitary forces known as the Free Corps, and was later murdered in January 1919. Her collection of political philosophies, collectively called Luxemburgism, is a revolutionary set of ideas under the realm of Marxism. The significant ideas of Luxemburgism include a pledge to struggle for democracy and the spontaneous class struggle which would organize itself to bring about revolution. Many socialists and Marxists may disagree with the philosophy of Rosa Luxemburg, but she will always remain as a steadfast revolutionary thinker who sacrificed her life for her principles. Her commitment to democracy and strong negation of capitalism has earned her the respect of Socialists from around the globe. The commemoration of Rosa Luxemburg as a martyr of Socialism takes place to this day, among the left-wing politicians of Germany, irrespective of their identification and agreement to her political philosophy. Decades after her murder, she is alive in her revolutionary ideas.